It is a Holiday weekend so you should already have the time off! It is an amazing piece of Roadside America! 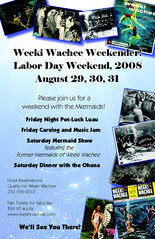 Please join us on Labor Day Weekend for a visit with the Mermaids at Weeki Wachee on the Gulf Coast of Florida. There will be a Pot-Luck luau Friday Night. We have access to a grill so something that can be cooked is an option. There will be a Carving and Music Jam Friday afternoon into the evening as long as people are willing to work or play. Bring your tools, or you instrument, or both, and have some fun with the Ohana. Saturday is the Big-Event! The Former Mermaids will have control of the Lagoon and will be performing for your pleasure. Saturday night will be a Dinner with the Ohana, details are still being worked out with the restaurant so more on that soon. It will be a whole lot of fun, even more so with you there.